Ha, the breakfast of champions. 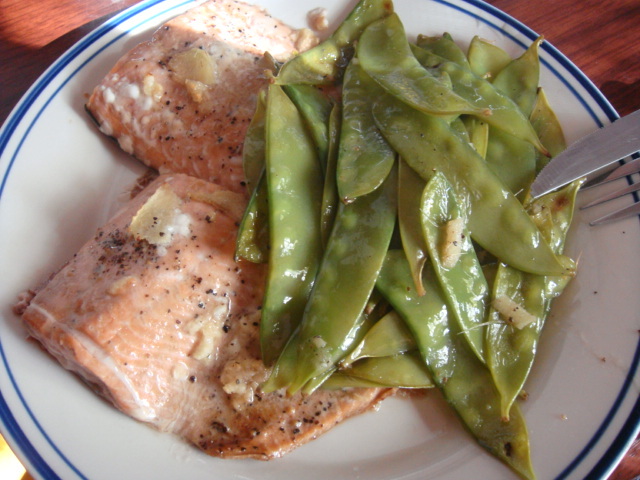 Sauteed wild salmon and snow peas with garlic, ginger, salt, and pepper. Then it's off to work. The boil has all cleared up and once again, I am a happy, happy woman. I'm down to taking only LDN and some basic vitamins. Hopefully, it will be another 7 months or longer before I grow one of these rat bastards again!!! My weight is stuck at 171 it seems, but I'm okay with that for now. At least I'm not gaining anything back. Keeping the loss is always the hardest part for me. Since I am still keeping away from sugar and junk starches I am not having any weird cravings and haven't been tempted to go on an eating binge. It's bizarre how I always have to con myself into eating small portions. It has gotten much easier ever since I got myself some smaller bowls and plates. Tomorrow starts the worrying. T-Jay is going to drive to Louisiana and stay there for a week. I'm happy for him, but on the other hand, I'm going to be worried until he gets back. I do hope that he makes it there safely and that he has a great time! I'm leaving work a few minutes early to see Jenna so that she can do something with this head of hair of mine. I'm trying to grow it out again, but am in the in-between stage and it's getting on my last nerve. I had the scissors in my hand twice yesterday morning, which is not a good thing. Jenna has been cutting my hair for the last three years. She gets off at 5 today, but she is staying late because I won't get off until five. All those negatives that I sent away got developed. I'm still going through them. Quite a few are of my son when he was just weeks old. It sure brings back some memories. I did delete one set that I accidently included....mainly because the negatives were so small that I couldn't tell what was on them. Anyway...they were of my ex-husband when he was in New York many years ago. I have a box of old photos to go through besides the ones at GoPhoto. After I sort out any duplicates, I'll start the long process of trying to scan them and put them in some sort of order. I did try out my scanner a couple of weeks ago with an old photo and the quality was excellent. I haven't decided yet what I will do with them, one thing is for sure, they won't be in a physical album. They'll be on a CD and some place online.